What is your specialty? 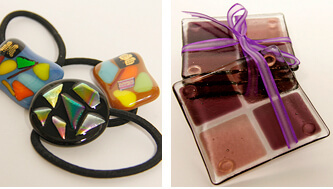 I have narrowed my attention to making fused glass items. Such as jewelry, barrettes, plates, magnets, and small vanity bowls . I like to add a western object such as the fetish bear, saguaros and chili peppers to my work. My other interest is photography. Due to limited space in the gift shop I only make greeting cards with my photographs. The photos are put on the cards with photo corners so that they are easily removed for framing. 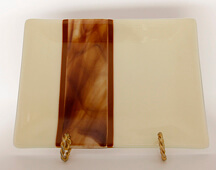 “I have been working with glass for many years and became interested in fusing glass in 2006. 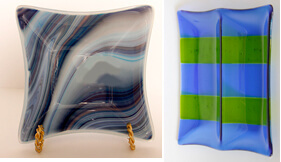 I make fused glass plates, bowls, dishes, spreaders, coasters, purse holders, wine stoppers, soap dishes, magnets, chopstick holders and jewelry. I work out of my home and have my own kiln. “The plates, bowls and small dishes are made by cutting various pieces of glass and layering them to create the desired shape and size of the final piece. The layered pieces are then placed in the kiln where they are fired to form a single piece of glass. A second firing is then needed to mold the glass into the desired shape. Each firing takes about 12 hours. This lengthy process assures that the glass is properly annealed. Annealing is what gives the glass its strength. 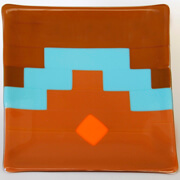 Some of my items (for example, my bear plates), may require three firings because of the added decorations.